Pragmatic Play has released an intriguing new pokie with a classic fruit machine design. It is about to show players that you can pack great big rewards into a mobile game. With 4 in-game jackpots to be won, Diamond Strike should quickly find many fans. With an up to 1000 coin prize and a very player friendly 96.48% RTP, this pokie will keep your mobile device buzzing. Unlike many other fruit machine inspired pokies, Diamond Strike has kept the bonus features you will find in video slots rather than strip the game down which makes this pokie more engaging and rewarding. 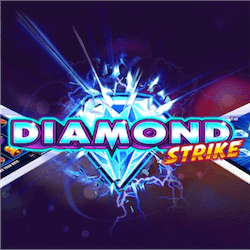 Players can expect free spins and special wild symbols in Diamond Strike. With 5 reels and 15 paylines, this pokie works great on mobile devices. It’s clear and bright graphics are easy to make out no matter where you are playing. But what fans really want to know is what bonus features this pokie includes. First off there is the Diamond Strike wild symbol that appears stacked on the reels. It can give you a great payout if it lights up with the right symbols. It won’t act as a substitute for the bonus symbols, only the standard reel symbols. The free spins features are triggered by the scatter icons appearing on reels 1, 3 and 5. If three of them appear on the reels at the same time, players get 8 free spins to take immediately. During this game the screen will almost be filled with Diamond Strike wilds, the reels will just be covered in shining diamonds. To trigger the big in-game jackpots, players will need to look to the Lucky 7 symbols. Three gold lucky 7’s and the special jackpot feature will activate. You will need to match three symbols on a new screen and will win either 10x, 30x, 100x or 1000x your staked wager. With a maximum wager possible of 75, you could walk away with a massive payout. Pragmatic Play recently secured their recent success in the industry by hiring several executives with years of experience recently. The move was an attempt to improve their commercial and management teams further. They have managed to acquire talent from developers Evolution Gaming and operator Leo Vegas to name a few. Pragmatic Play has managed to grow in leaps and bounds this year and the new staff should keep the company doing great things in 2018.